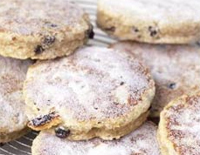 Welsh Cakes. The ultimate post ride snack. Fact. I took a supply on a 7stanes trip the other week & they were liked by all. So here’s the recipe. Click the link for a pdf or right click & ‘save target as’ if you want a copy. As with all cakes, best eaten warm, although that might prevent them getting to the trails..! Not sure where they rate as energy food for fitness freaks but they’re an awesome post ride snack. We all know that all cake is compatible with biking! This entry was posted in CAKE!, MTB Food, Other Good Stuff! and tagged Ride-Cake-Ride-coffee-Ride... on April 4, 2010 by steve.